This online course offers parents and educators practical strategies for changing problem behavior and avoiding future behavior difficulties. It provides step-by-step guidance on how to implement effective strategies to change problem behaviors and encourage positive behaviors for children with Down syndrome. Individual advice and support is also offered to participants through an online discussion forum. Some children and teenagers with Down syndrome develop behaviors that can disrupt their learning and social opportunities and that cause challenges and stress at school and at home. Problem behaviors can be changed but may need different approaches to those that work with other children. This course aims to support parents and educators to implement individualized plans to improve behavior and to secure new positive behaviors. The course is led and supported by Professor Sue Buckley OBE, an internationally recognised expert in development and education for children with Down syndrome. The course includes five modules explaining how to assess the child’s needs, develop an effective strategy for changing behavior, teach new positive behaviors and move forward. Handouts include practical worksheets to support the implementation of a successful behavior change program. Individual support is also available to participants through an online discussion forum. The course includes 5 modules, each of which includes a video presentation, handouts and an assessment. The video presentations can be viewed, handouts downloaded and assessments completed at any time. In addition, course participants are invited to join an online discussion forum with DSE tutors for the opportunity to ask questions and seek additional advice. Course participants should plan to spend a minimum of 8 hours studying the course. Further time will be required to apply the guidance, plan and implement the behavior change program. Participants are provided with 12 months access to the course and support forum. The course is accessible to participants in any country. A computer with a modern web browser and a reliable Internet connection sufficient for streaming videos is required. Getting started - what is the problem behavior? 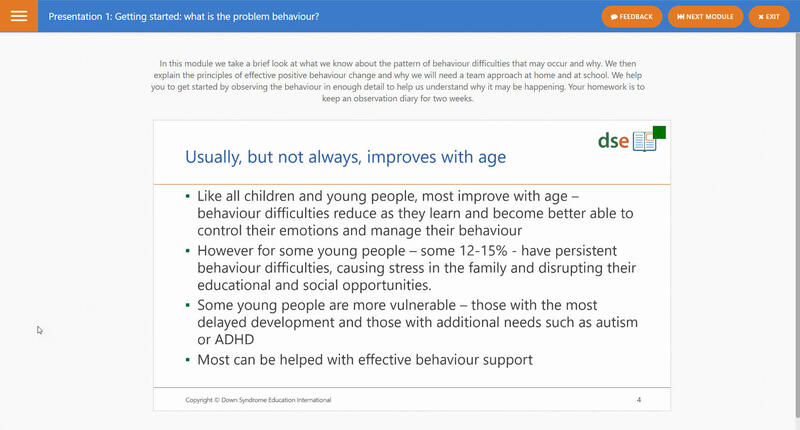 In this module we take a brief look at what we know about the pattern of behavior difficulties that may occur and why. We then explain the principles of effective positive behavior change and why you will need a team approach at home and at school. We help you to get started by observing the behavior in enough detail to help you understand why it may be happening. Your homework is to keep an observation diary for two weeks. Why do we think it is happening? 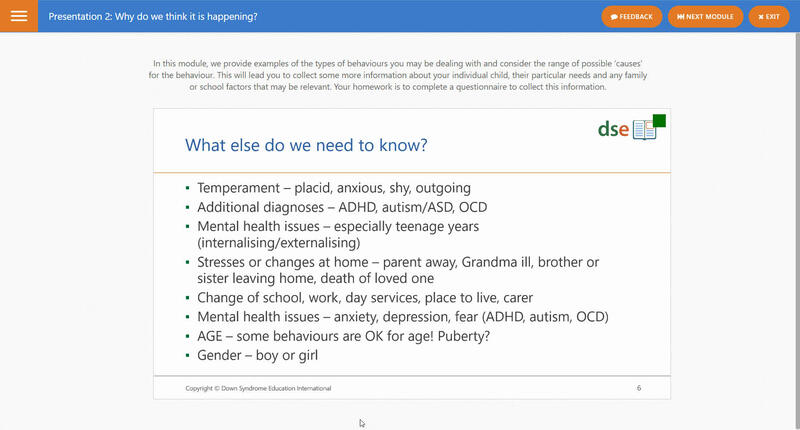 In this module, we provide examples of the types of behaviors you may be dealing with and consider the range of possible ‘causes’ for the behavior. This will lead you to collect some more information about your individual child, their particular needs and any family or school factors that may be relevant. Your homework is to complete a questionnaire to collect this information. How can we change the behavior? We describe some effective strategies and provide examples of plans to tackle a range of behaviors for children and young people of different ages and abilities. Examples include behaviors that may be occurring at home or at school in the day time and sleep difficulties. They should provide you with the strategies you need. 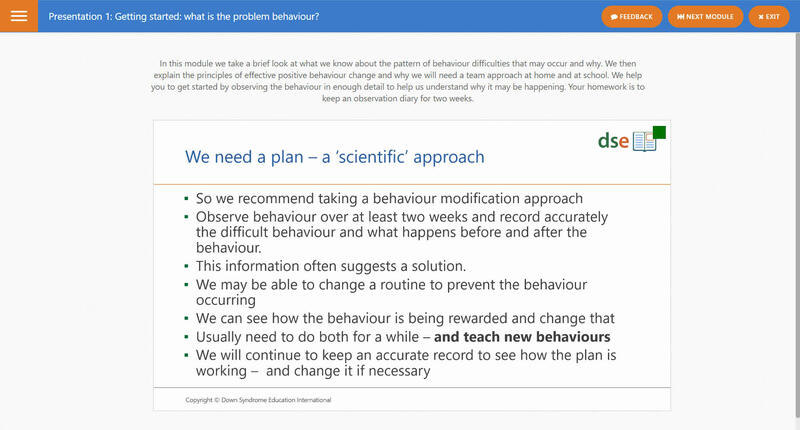 Your homework is to summarize the key information you have now collected ready to write a behavior change plan. How do we implement the plan and monitor progress? We review the key steps to developing and writing a behavior change plan. We then discuss how to ensure everyone is confident and ready to implement the plan consistently. We provide guidance on how to monitor the plan to see if it working and revise it if necessary. Your homework is to write the plan, decide how to review progress with your team and get the plan started. How do we prevent future difficulties? 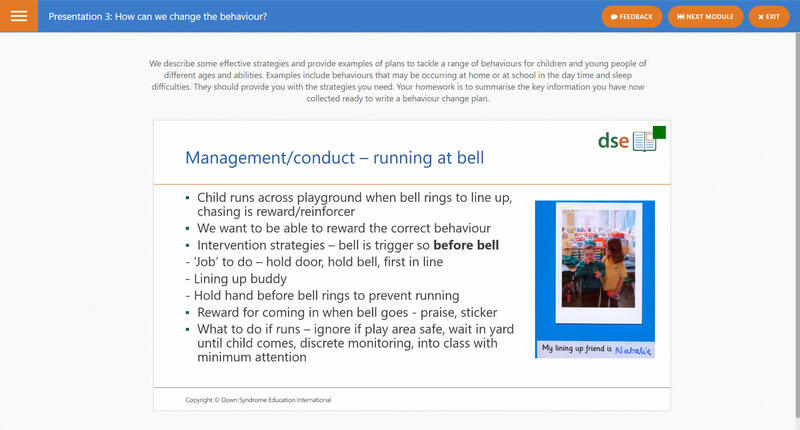 By the time you get to this module you should be confident about managing behavior. You will know that many factors influence an individual child or young person’s behavior. We will ask you to think ahead and make a list of the positive strategies you need to keep in place to help your young person to continue to learn in all areas of their development and to manage their behavior. We recommend setting aside around 90 minutes per week for 5 weeks to study this course. Further time will be required to apply the guidance, plan and implement the behavior change program. The course is available to participants in any country - all you need is a reliable Internet connection sufficient for streaming videos.